1. Heat oil in a large nonstick skillet over high heat. Sprinkle scallops with salt and pepper. Add scallops to pan, and sauté 2 minutes on each side. 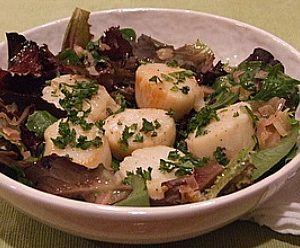 Remove cooked scallops from pan, and keep warm. 2. Melt butter in pan. Add shallots and garlic; sauté 30 seconds. Add wine and juice; cook 1 minute. Return scallops to pan; toss to coat. Remove from heat; sprinkle with parsley. Place greens in bowl, and toss with olive oil. 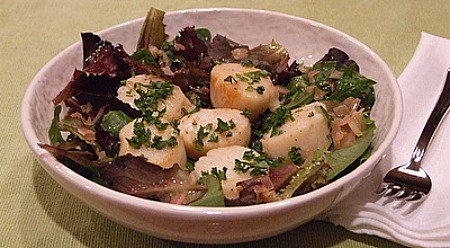 Serve scallops over mixed greens.